In the publication “Conditions for the start and spread of crown fire”, C.E. Van Wagner (1977) identified that crown fire is the interaction between separate fuel layers in forested areas. Crown Fire Initiation is an indicator of the potential for surface fire to ignite tree crown and produce either passive or active crown fire. Inputs include the gap between the surface fuels and the tree crowns (Canopy Base Height – CBH), the foliar moisture content (FMC) of the tree crowns. The result is a threshold surface fire intensity required to produce some crown fire. These models are very coarse due to the way they represent highly variable characteristics, canopy base height and canopy fuel density. Because they are so variable, their inputs represent grand averages and may require adjustment in modeling efforts. As shown in this matrix, the Crown Fire Initiation and Active Crown Fire Propagation models work together to estimate when fires will remain as surface, when they will produce torching, or passive crown fire, behavior in the canopy, and when they will progress to active crown fires. Use the model results from sections Crown Fire Initiation and Crown Fire Propagation to compare against estimates of surface and crown fire spread produced using anticipated environmental factors. 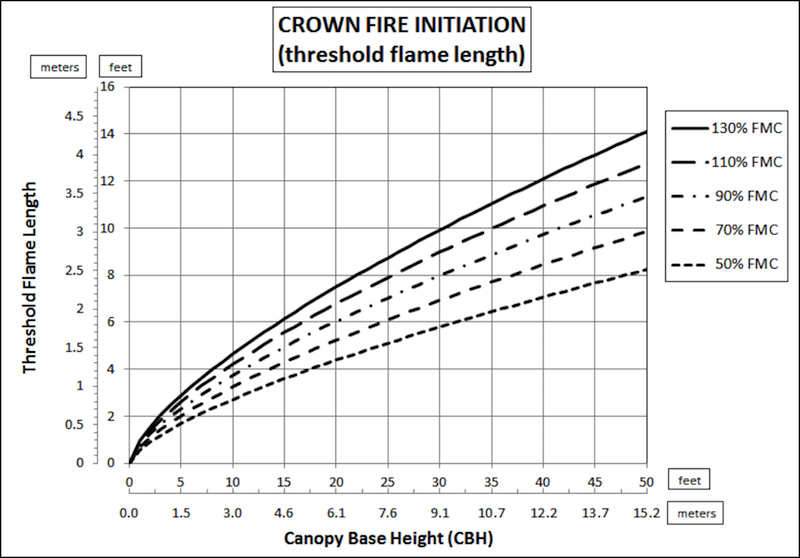 These two graphs identify the height to live crowns (CBH) and the canopy foliar moisture content (FMC) as critical factors, resulting in the threshold surface fire intensity or flame length for evaluating of crown fire initiation. Use either of them to estimate minimum surface fireline intensity (FLI) or flame length (FL) that will support at least passive crown fire. Use either of the two graphs below. This assessment only determines whether surface fire behavior is sufficient to initiate crown combustion. Both passive and active crown fire are possible if this threshold is met. See the criteria for active crown fire above under Linking Surface and Crown Fire Behavior to differentiate those conditions. Determine the current and/or expected surface intensity (FLI or FL) for that landscape. Estimate the CBH and FMC for the landscape you are evaluating for crown fire potential. Lookup the threshold surface intensity from either graph here. Compare the two intensities. 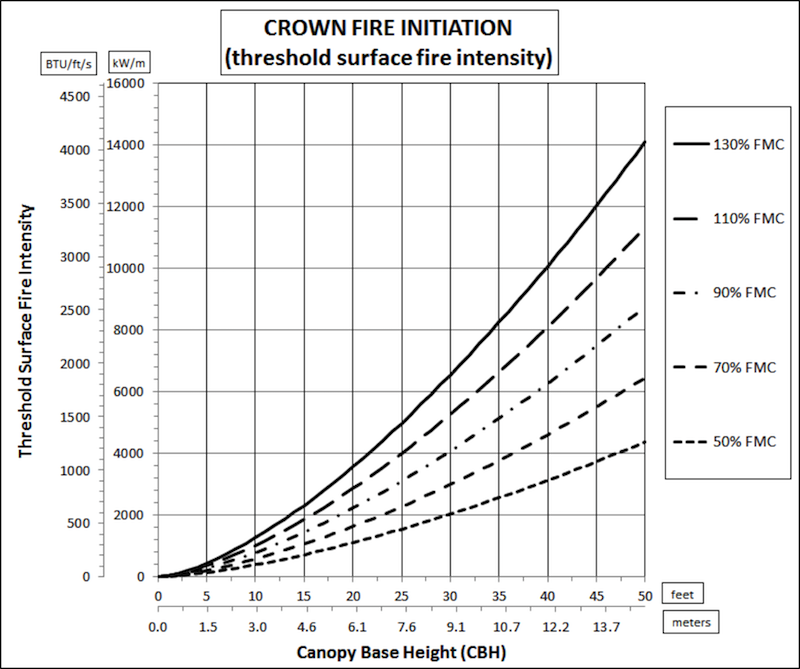 If the projected intensity is greater than the threshold value, crown fire is expected. A ratio of projected over threshold provides a confidence value. According to Van Wagner (1977), minimum threshold values for canopy fuel/bulk density (CBD) are necessary to sustain active crown fire at given spread rates. 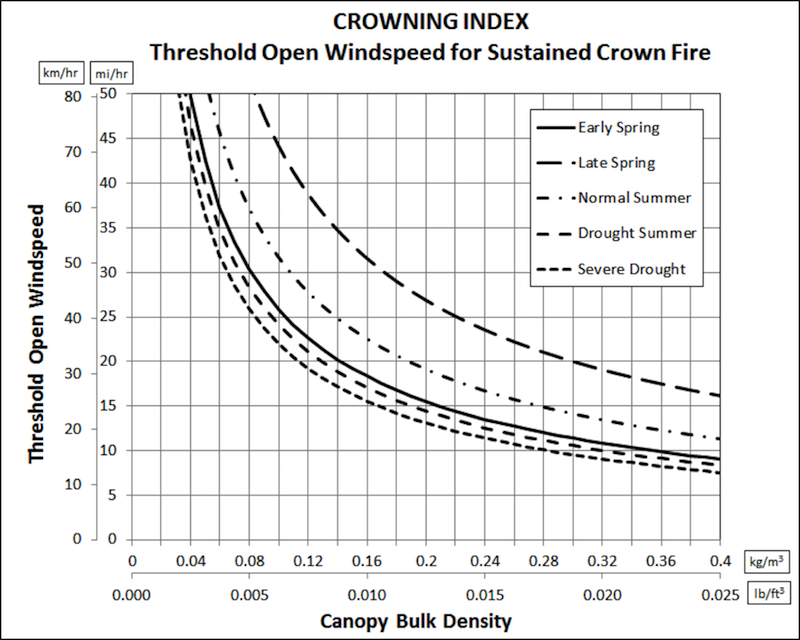 Since there is only a single crown fire fuel model, that threshold spread rate can be converted to a threshold windspeed or “crowning index” (CI). The table and the graph below it provide threshold values for both ROS(active) and open 20 ft windspeed. For a given CBD, if observed, or forecast 20 ft wind or projected ROS(active) are larger than these threshold values, sustained active crown fire is expected. A ratio of estimate/threshold provides a confidence value. Final spread rates for passive and active crown fire. Fire Type (Surface, Passive, Active). Both US and CFFDRS systems implement the initiation and active crown fire criteria where crown fire is anticipated. This table compare the different ways the criteria are implemented. Crown Fraction Burned Natural Log function based on the difference between estimated spread rate and Initiation Threshold spread rate. 90% when estimated spread rate is 10m/min greater than Initiation Threshold spread rate. Natural log function based on the difference between the estimated surface spread rate and the Initiation Threshold rate. 0.9 when surface spread rate reaches 90% of difference between Initiation Threshold and Active Propagation threshold. Proportionally intermediate between 0 (surface fire) and 1.0 (active Crown Fire) based on input windspeed and where it falls between windspeeds at Initiation Threshold and Active Propagation Threshold spread rates. Passive Crown Fire Spread Integrated within basic spread model for conifer & mixedwood fuel types. Fire type designated as Passive based on estimated Crown fraction Burned (see below). Surface Fire spread rate plus any spotting spread. Based on Crown Fraction Burned (CFB). Proportionally intermediate between surface spread rate and Active Propagation threshold, based on crown fraction burned plus any spotting spread. 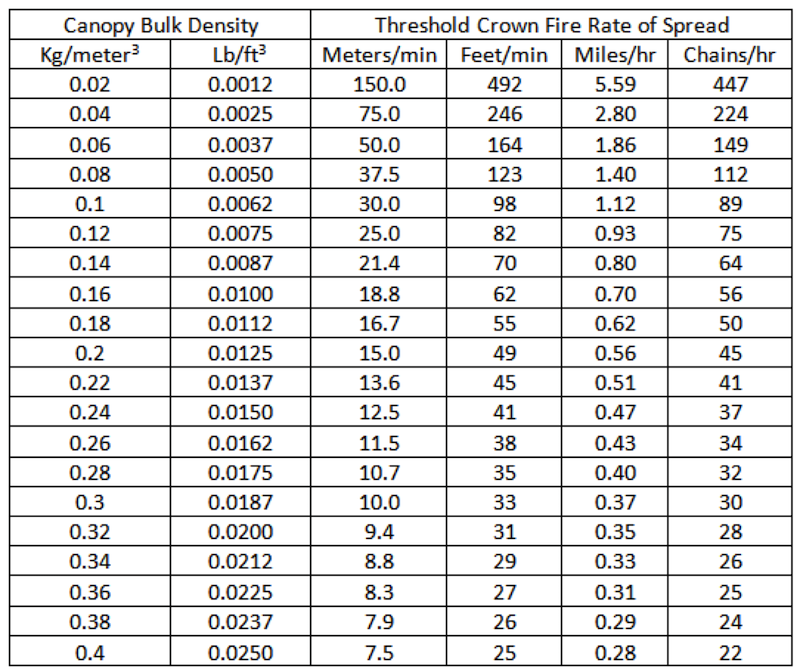 Final Spread Rate with Active Crown Fire Integrated within basic spread model for conifer & mixedwood fuel types Fire type designated as Passive based on estimated Crown fraction Burned (see below). Proportionally intermediate between surface spread rate and Rothermel 1991 Model based on Crown Fraction Burned. Generally, less than half of Rothermel model rate. Spread Rate estimated directly from Rothermel 1991 crown fire spread model. Active if ROS > Active Crit.